Nina Gualinga, an indigenous woman leader of the Kichwa community of Sarayaku in the Ecuadorian Amazon, is the recipient of this year’s WWF International President’s Youth award. 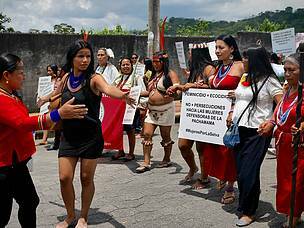 Cartagena, 8 May 2018 - Nina Gualinga, an indigenous woman leader of the Kichwa community of Sarayaku in the Ecuadorian Amazon, is the recipient of this year’s WWF International President’s Youth award. An advocate for climate justice and indigenous rights since the age of eight, the award recognizes Nina’s relentless efforts to protect nature and communities in the Amazon at a time when the region is under unprecedented threat from unsustainable use and exploitation. “Today as biodiversity declines and the natural systems that sustain us come under increasing pressure, the courage, determination and leadership shown by Nina and her community inspires us all. This drive to protect nature - the living fabric that underpins our well-being and prosperity - is absolutely what we need to halt environmental degradation, for the benefit of people and the planet. Nina's achievements are a reminder of the change we can create if we all take a stand for nature, urgently and unreservedly,” said Pavan Sukhdev, President, WWF International. Nina, 24, has spent most of her childhood and all of her adult years advocating for better, stronger protection of the Ecuadorian Amazon and the wildlife and people who depend on it. 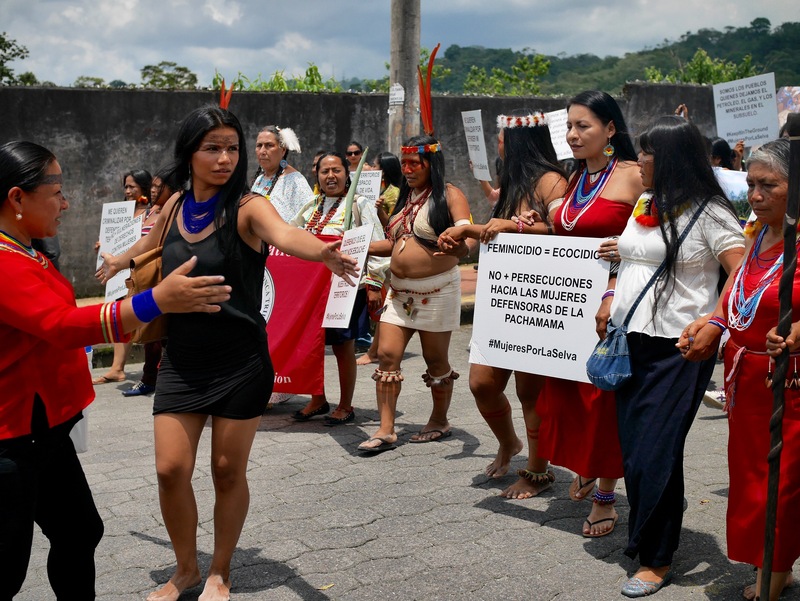 At 18, she represented Sarayaku youth at the final hearing before the Inter-American Court on Human Rights in Costa Rica, winning a landmark case against the Ecuadorian government for violating Sarayaku rights and territory for oil drilling. Today, she continues to represent the community and calls for indigenous rights and a fossil fuel free economy at various national and international fora including the historic Paris Climate summit. “My inspiration comes from the earth itself, all the beauty of life expressed in so many ways. My motivation comes from the people around me who are fighting every day to protect their families and their home, the Amazonian rainforest. I am very thankful to receive this prize because to me this prize not only honours my work, but it honours the work of everyone that fights by my side for the well-being of our planet and our people,” said Nina. “For far too long, nature’s story has been one of decline and it is heartening to see young people like Nina take matters into their own hands to change the narrative. This generation has seen how high the stakes are, and they are determined to show that their courage and ambition is higher,” added Sukhdev. Madison Pearl Edwards from Belize is another example of how youth around the world are stepping forward to help protect the planet. 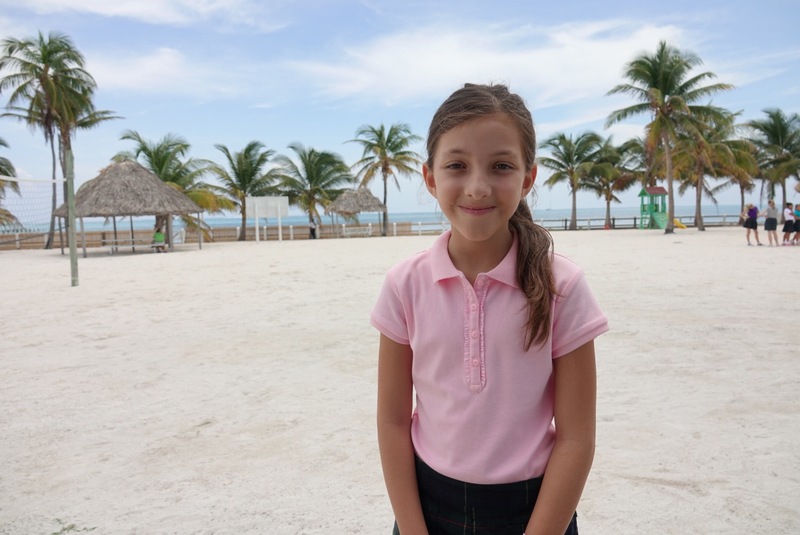 Recognized with a special mention at the awards ceremony, 12-year old Madison has been advocating for the protection of the Belize Barrier Reef, the second largest reef system in the world and home to Belize Barrier Reef Reserve System World Heritage site, for the past three years. Through her blog and social media, Madison has helped mobilize public support against offshore oil exploration in Belize, which resulted in the adoption of the permanent moratorium on all extractive activities in Belize waters in December 2017. The move not only made Belize one of only three countries in the world with such legislation but is expected to help take the Belize Barrier Reef World Heritage site one step closer to being removed from the List of World Heritage in Danger. “I feel proud that Belize has taken such an important step forward and that we helped make it happen but there is so much more we all can – and need to – do. Destroying our natural resources with selfish and short-sighted interests is not OK. I’d like to encourage children around the world to stand up for our planet. Our parents and grandparents have enjoyed a beautiful home and we and our children deserve the same. Together we must send a message to our leaders that they are responsible for the planet we will live on in the future and they must make it one they would be proud to leave behind," said Madison. “Nina and Madison show us that no matter where we are or how old we may be, our voices and actions can create meaningful impact for the planet, the one home we all share. Building a sustainable future for all starts with taking action on nature loss and climate change today and it is both remarkable and inspiring to see such young citizens lead the way,” said Sukhdev. The 2018 WWF International President’s Youth Award will be presented in Cartagena, Colombia at 8:30 a.m. local time today. The award acknowledges and encourages outstanding achievements of young people under the age of 30 who are making significant contributions to nature conservation. Nominations are invited annually via WWF offices around the world. Nina Gualinga is a 24-year-old indigenous woman leader of the Kichwa community of Sarayaku in the Ecuadorian Amazon. The Sarayaku community has a population of about 1.250 people, and its lands cover more than 333,000 acres, mostly pristine forests. Because her mother is from Sarayaku and her father is from Sweden, Nina considers herself as the bridge between two worlds. Since she was eight years old, she has been actively involved in local, national and global advocacy efforts in defense of indigenous rights and territories in the Amazon, and for climate justice. She has participated in various international fora such as several the UNFCCC COPs (Lima, Paris, Marrakech and Bonn), the 2016 IUCN World Conservation Congress, among others, always advocating for the importance of protecting the environment and reducing global usage of fossil fuels. Nina is also the co-founder of ‘Hakhu Amazon Design’ an initiative aimed at providing a unique opportunity to indigenous women in the Ecuadorian Amazon and beyond, using their cultural and artistic heritage in a way that protects their territories while providing them with a sustainable source of income. 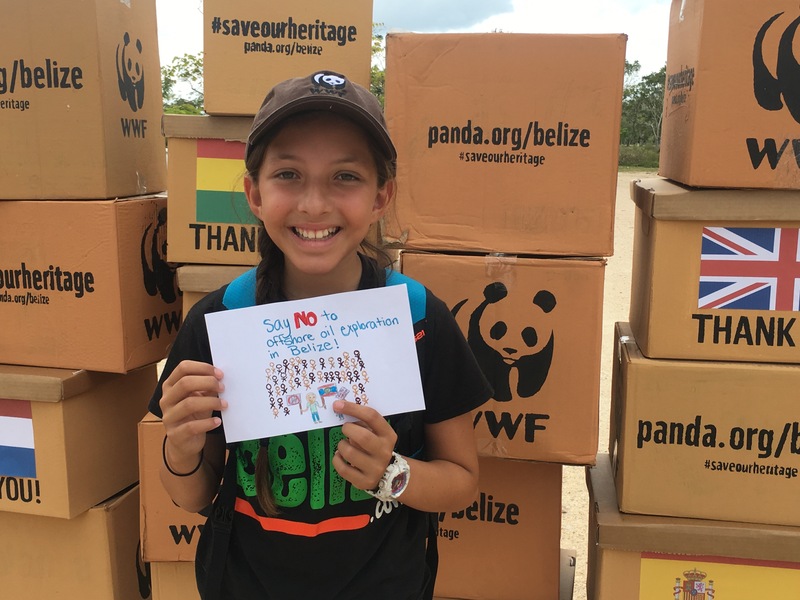 Madison Pearl Edwards is a twelve-year-old Belizean environmental activist. For the past three years, Madison has been the leading voice of the young generation of Belizeans advocating for the protection of the Belize Barrier Reef, the second largest reef system in the world and home to Belize Barrier Reef Reserve System World Heritage site. Madison is an active blogger and has been using social media to amplify her message. 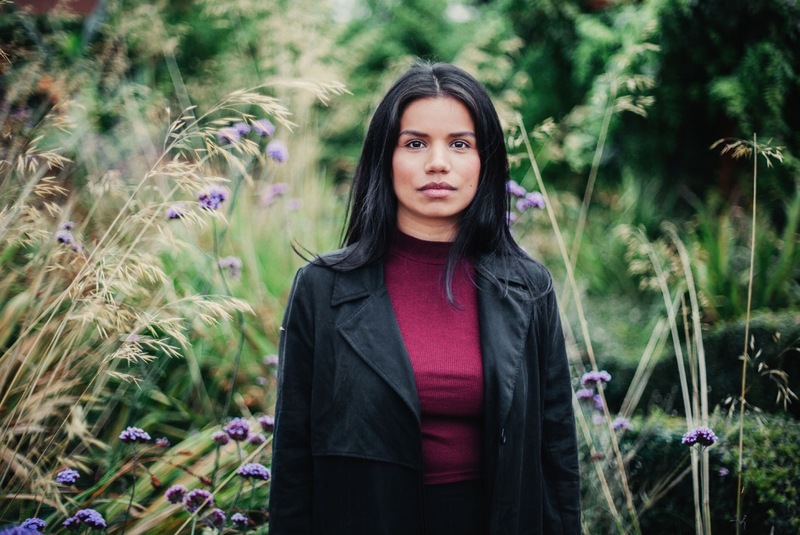 Nina Gualinga, the recipient of the 2018 WWF International President’s Youth award, has been an advocate for climate justice and indigenous rights since the age of eight. Through her blog and social media, Madison Pearl Edwards has helped mobilize public support against offshore oil exploration in Belize.